This movie is only for the spiritually fit as it packs an emotional punch in the gut and one need’s to be healthy enough to take a body blow. 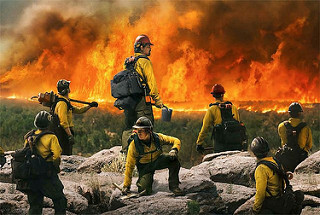 The story is based on true events of the firefighters of Prescott Arizona, known as the Granite Mountain Hot Shots, who wanted to be the first municipal group to be certified as Hot Shot Firefighters which entitles them to be Tier 1 fighters in these massive, out-of-control forest fires that sweep through a valley or a mountainside destroying entire neighborhoods. Only the brave and highly-trained need apply. The supervisor of this band of heroes is played by Josh Brolin and his boss is Jeff Bridges so things start out on the right foot because these two movie stars are outstanding actors and seem to always bring authenticity to the screen whenever they suit up for a part. Throw in Jennifer Connelly and Andie MacDowell as their wives with Miles Teller playing the immature rookie who needs Brolin’s big-brother guidance and Director Joseph “TRON: Legacy” Kosinski has a mix that can’t miss. And it didn’t. Great acting! Through outstanding special effects and superb cinematography, the fires, with the feminine handle of a “her,” is brought up-close and personal into the lap of the audience. I felt like I was on the line with these Hot Shots as they were feverishly digging and clearing a fire line in order to turn the blaze. And Kosinski kept the heat on when needed to remind his audience of the terror and life-threatening danger that confronts these guys every time they attack gigantic and unpredictable firestorms. Intense character development by Kosinski was essential to the plot and made me deeply care about these men. I was pulling for them and scared that something bad might happened. This screenplay is plodding in the first half of the movie, but stick with Kosinski as he painstakingly builds the characters and educates his audience while setting up a monumental conclusion. Rock ‘n Roll.